The Geovista Three-Arms calliper sonde is a popular choice for borehole diameter logging and borehole volume calculation. The Geovista Four-Arm caliper is particularly useful in large boreholes. Working either in 4 radii (r1, r2, r3, r4) mode or in two diameters (d1, d2) mode, this sonde can provide an accurate borehole geometry profile as well as borehole volume. NEW: Geovista now supply a 2-arm caliper sonde that has independent arms. 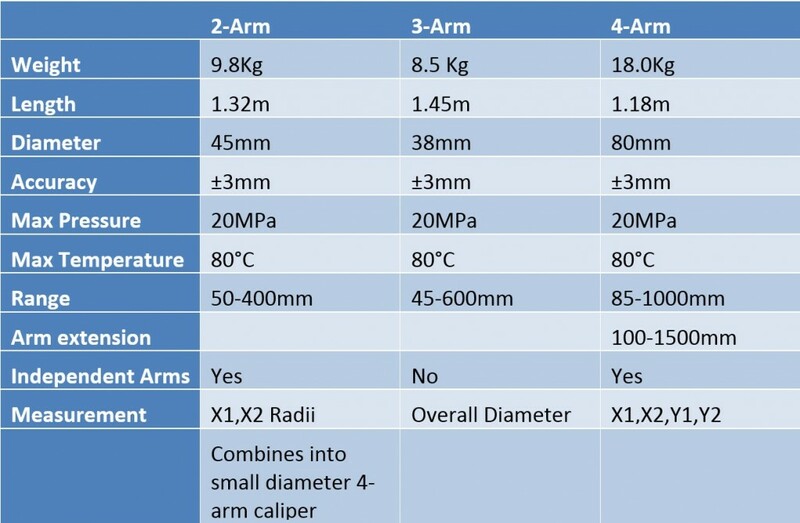 This tool is very useful when the need to acquire 4 individual arm measurements in slim holes is required – these tools can be connected together to solve this problem. Add a verticality sonde for orientated measurements. Like other Geovista sondes, all the calipers can be run on their own or they can be screwed together to run as one single tool string.